Egypt's beleaguered president today failed to step down as people were told he would do but demonstrators say they'll escalate the protests. Hosni Mubarak was expected to use his state of the nation address to resign this morning, but instead said he will stay in office and transfer all power only after September's presidential election. The army had earlier told anti-government demonstrators Mubarak was resigning. 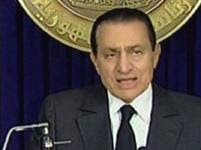 The president of the United States had also indicated America had managed to persuade Mubarak to go. Observers say Mubarak is in his last days and knows the people want him out but is making a last play for power. f) giving too little too late and his offers of sweeteners will not be enough. There will be chaos in Egypt....the protestors are still at Tahrir square demanding his resignation. On twitter the former UN nuclear chief and Nobel Peace Prize winner Mohamed ElBaradei said Egypt will explode and the army must save Egypt now. Note: The army's role in Egypt has turned out to be very interesting. They were once in solidarity with the President Hosni Mubarak. But once the people revolted and had an uprising, the army started to listen. After initially beating the protestors, they said they will protect them. And now there is a possibility that they will arrest the President and force him to resign as the people want. Take note Fiji ...never underestimate the power of the people. Golly - who does this remined you of? One things certain - getting rid of local incumbent will be even harder. I am certain there is noone that has the ball's to stand up to Bai for most snivellers have elasticised spines all they good for is spouting off their mouths. They all come across as toothless tigers. E levu ga na vosa. Here is something for you toothless tigers to ponder. Reminds me of Jake the poor misguided soul. Under the bludgeonings of their fist. They pulp my head until I cannot resist. My name is Rabaka, God help my poor soul. For my brothers beat me until I was cold. For while I was on Earth I had no mercy. And free us from the Military tyranny. In memory of Rabaka and all those that treasure Freedom. Don't you have farm animals to pester? mubarak stepped down and handed the power to the army. people power have won . people have more power than govt/leaders. My dearest adversary you’d be most joyous to know I have this morning name one of favourite milking cows after you with a slight variation of course she is to be known as “Radio Lily”. I hope the Bainimarama Government is treating very well albeit restrictively.